Items adorned with the hand-painted elegance of henna. These are gorgeous! 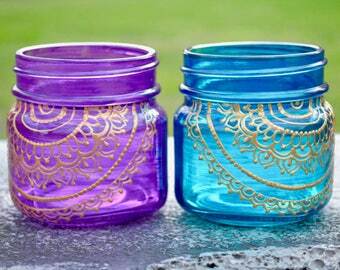 We used them as decor and favors for my daughters henna party and they are darling! Thank you! I absolutely love these and will use them for my Mehendi party next month. Hajar (the artist) is very friendly and responsive. The candles arrived quickly, look absolutely beautiful, and were packed very carefully with pretty tissue paper and a note. I am extremely happy with this purchase. Thank you Hajar! I'm so excited to share my love for henna art with you! I am a stay-at-home mom of 3 boys and 1 sweet baby girl. I am a self-taught henna artist with a love for all things artsy. All my items are hand-painted by little 'ole me and I put a lot of love into each piece. I hope you love what you see! I will continue to add more items over time so please stop by again soon! I hope that your purchase is everything you expected. However, if you are in anyway displeased with your item(s) please contact me. If you would like to cancel an order before it ships, I will gladly refund your full purchase price including shipping. Once your order ships and you receive your items, you have 3 days to contact me about returns. Upon receipt and inspection of your returned (undamaged, unused) item, I will issue a full refund minus shipping costs. If you receive your item and it is damaged, please let me know and send pictures of the damage. I will gladly replace that item in the case that you had selected to use Priority Shipping which includes insurance. If your item arrives damaged and you did NOT choose Priority shipping or purchase additional insurance, I will not be able to replace your item without charge nor will I be able to issue a refund. If you are unhappy with your purchase, and you have contacted me within 3 days of delivery, take care to package all returns in a secure manner. If you are returning an undamaged item, and it is delivered to me damaged, I will not be able to issue a refund. I accept Paypal, credit/debit card payments and Etsy gift cards. All payments must be received before items can be shipped. Orders will be cancelled and items will be re-listed if payment is not received within 5 days of purchase. I use USPS for all US orders. I prefer to use Priority Shipping but I have chosen to allow the client to choose mode of shipping. Please choose wisely. Priority shipping includes insurance and tracking. If you choose a cheaper method which does not include tracking or insurance, there is nothing I can do if the package is lost or items are damaged upon arrival. I strongly encourage all clients purchasing mugs and other delicate items to select the Priority option. Although there are shipping time-frames listed, these are just guidelines and are flexible based on the amount of work orders open. There are times of the year that are so busy that shipping may be delayed. Please know that I try my best to make the shipping time-frames but I am a one-woman show and may not be able to avoid it. Thanks in advance for your understanding and patience. I do accept custom orders! I would be more than happy to make something special just for you! I will accept bulk orders for weddings, showers, favors, gifts, etc. Feel free to message me with all the details! I'm more than willing to work with shops wanting to do wholesale orders. There are so many color options in both glossy gem tones and frosted finishes. There are also several options for the detailing paint color. Just tell me what you need, and I'll try my best to make it happen! My items are all water-proof. My tea sets and mugs are all dishwasher safe. I do, however, suggest hand-washing for longevity.